Vermont is a cool place and it’s getting cooler. 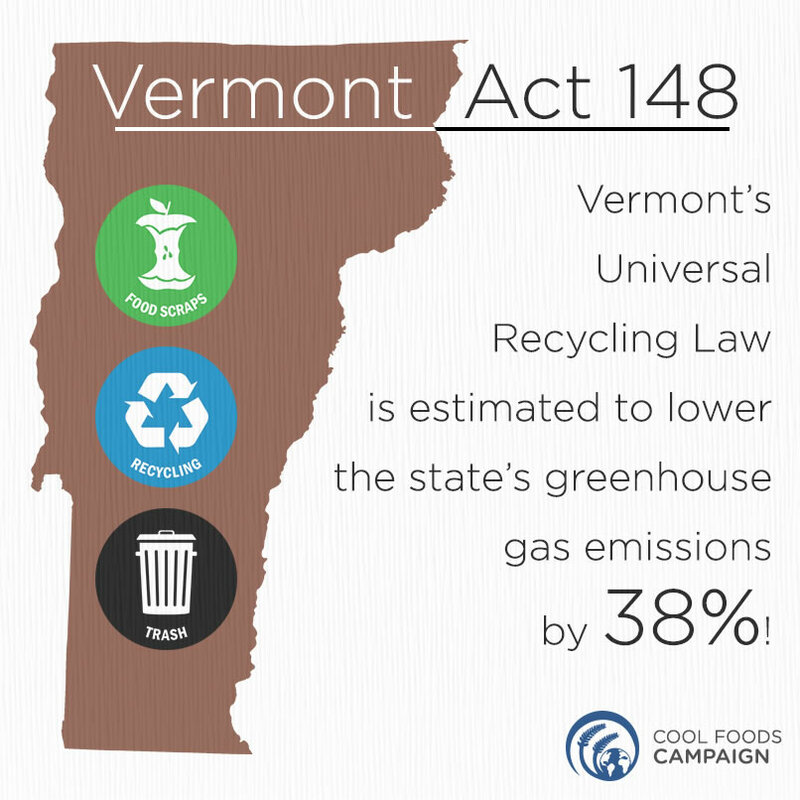 The Green Mountain State passed a “universal recycling law” (Act 148) that has a number of progressive provisions including mandatory composting. Starting this summer, enterprises that generate two tons or more of food scraps per week – e.g., grocery stores, restaurants and food producers – must divert them from landfills. Because the law is being phased in over several years, residents have until 2020 to comply. After that, food scraps and yard debris (i.e.,leaves and wood scraps) will be banned from landfills. If this sounds a bit draconian, consider this: according to the EPA, food waste accounts for 14.5 percent of municipal solid waste. Add yard trimmings and you reach 28 percent of America’s waste stream. Add wood and paper to the equation, and the amount of biodegradable material headed to the landfill reaches a whopping 62 percent. You might ask, “If it’s biodegradable, then what’s the problem?” The problem is that all of this material unnecessarily ending up in landfills harms the earth’s delicate climate system, which affects us all. Let's look at the difference between what happens in a landfill and in a compost facility: When the remains of your “soup ‘n salad” is tossed in the trash it heads for the landfill. Once in the landfill, it is packed so tightly that oxygen cannot aid decomposition. Instead, the food scraps release methane, a potent greenhouse gas with 21 times the global warming potential of CO2. When, however, those same soup ‘n salad scraps are tossed in the compost bin, oxygen enters the picture. Oxygen allows the food scraps to become food for other creatures, including hardworking soil microbes that miraculously turn those soggy scraps into a valuable soil amendment known as compost. Applying compost to soil enables it to become rich and healthy for your plants, and better able to store atmospheric carbon. While it is best to avoid wasting food in the first place, none of us are perfect, and some amount of food waste is inevitable. Fortunately, more and more states are waking up to the fact that food waste is a moral problem and a climate problem, as well as a tremendous opportunity to take a significant slice out of our methane emissions. But, to follow Vermont’s bold lead will take investments in not only infrastructure, but education campaigns, and changes in policy. In terms of education, everyone can learn from school children in New York, where school composting kicked off two years ago and 25 percent of public schools are already participating. Not only is a new generation participating in the circle of life, the Big Apple is saving from $10 to $50 dollars per ton in fees at the dump. New York's goal is to move to 100 percent participation. Meanwhile, on the policy front, San Francisco has already set the gold standard for municipalities. The City by the Bay has been requiring residents and businesses to separate and recycle food waste since 2009 and with an 80 percent landfill diversion rate, has set a North American record for recycling and composting! Each summer, Center for Food Safety has law students from around the country clerking at our San Francisco offices, and learning the simple office composting protocol is part of their orientation. Even though these students are committed food activists, office composting in the city is often a novel experience. But it’s one that makes sense – once you get used to composting at home, it is just as easy to exercise these skills at the office. How do city residents feel about universal composting? According to San Francisco resident Gina Riggs, "composting is great because it makes your garbage less smelly, and it makes you feel good to know that you are doing something with environmental benefits right in your home." We agree: composting is an integral and satisfying part of a climate-smart lifestyle. For tips on how to get composting in your home, office or school, check out our “Watch Your Waste” board on Pinterest. Once composting becomes second-nature, you’ll be ready to advocate for your school, city and state to join the compost revolution. So cheers to Vermont, New York, San Francisco and others leading the charge for composting; they've recognized that throwing things "away" comes at a cost. Once the rest of the country catches on to the monetary and climate benefits, we may well be on our way to becoming the United States of Compost!